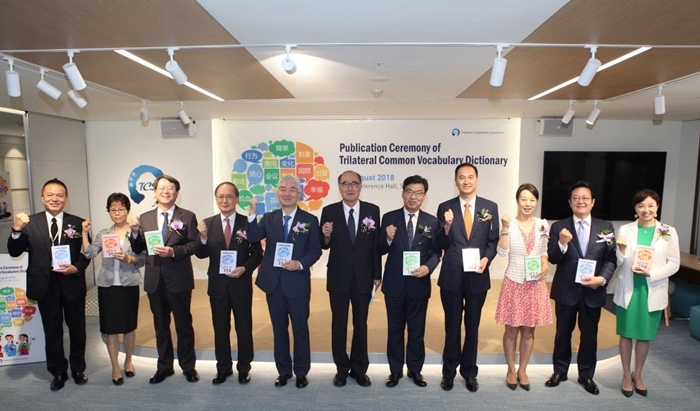 TCS organized Publication Ceremony of Trilateral Common Vocabulary Dictionary in the TCS Conference Hall on August 16, 2018. High-profile government officials, representatives of media organizations and relevant stakeholders of the three countries including H.E. LEE Hong-koo, Former Prime Minister of the ROK, H.E. SUH Jeong-in, Deputy Minister for Planning and Coordination of Ministry of Foreign Affairs of the ROK, H.E. NAGAMINE Yasumasa, Japanese Ambassador to the ROK, H.E. JIN Yanguang, Charge d’Affairs, Chinese Embassy to the ROK, Mr. KIM Gyo-joon, Publisher of the JoongAng Ilbo, Mr. TAKEOKA Rinji, Managing Executive Officer of the Nikkei Shimbun, Ms. SUN Yanping, Deputy Director-General of Foreign Affairs of Xinhua News Agency and Ms. QU Huan, President of Korea-China Association for Cultural Exchange attended the ceremony. 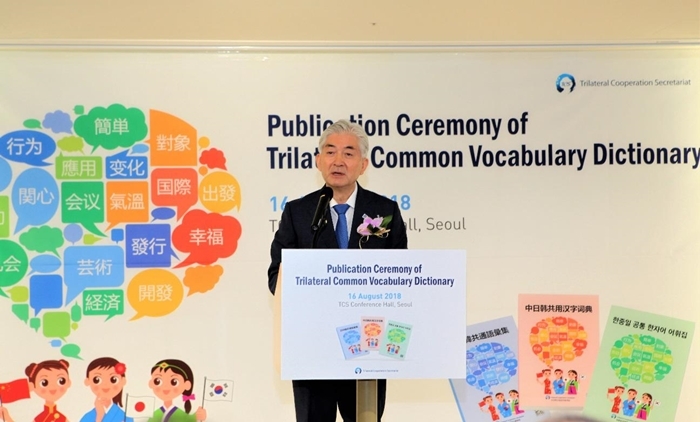 After the introductory video of Trilateral Common Vocabulary Dictionary (TCVD), TCS Secretary-General LEE Jong-heon delivered opening remarks and emphasized the significance of TCVD as a milestone for facilitating communication and fostering mutual understanding among the three countries. He hopes that the TCVD can be a positive stimulus for the three countries to overcome the communication barrier and promote cooperation. 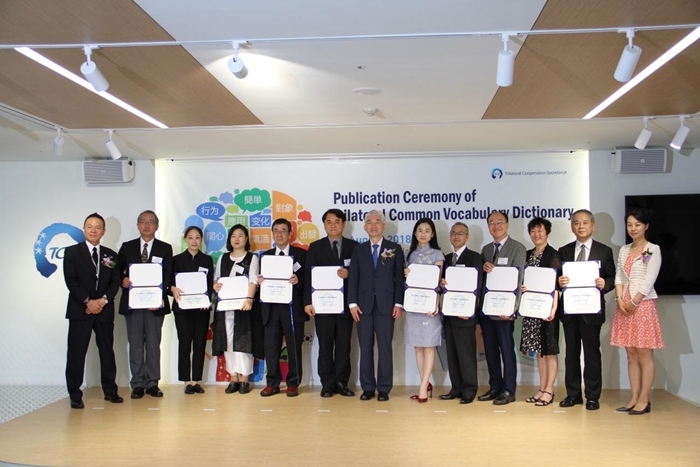 The ceremony also brought together TCVD Editorial Committee members and provided Trilateral Cooperation Contribution Award to experts who involved into the compilation work of TCVD. 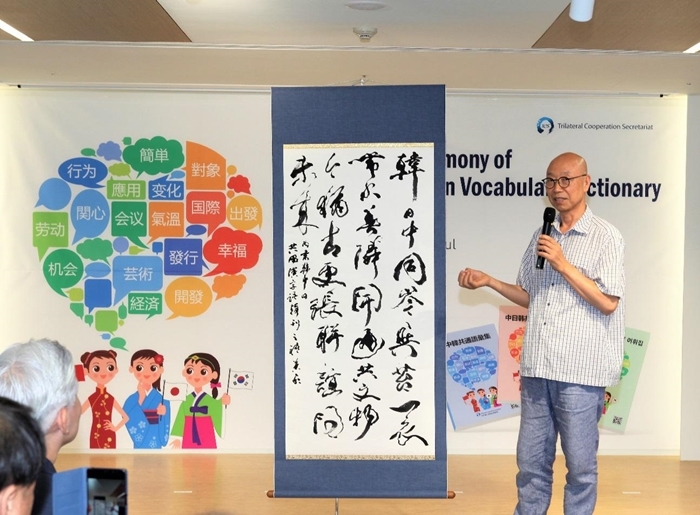 The ceremony was followed by the Calligraphy and Korean traditional music collaboration performance where the calligrapher composed a poem for the friendship of the three countries. 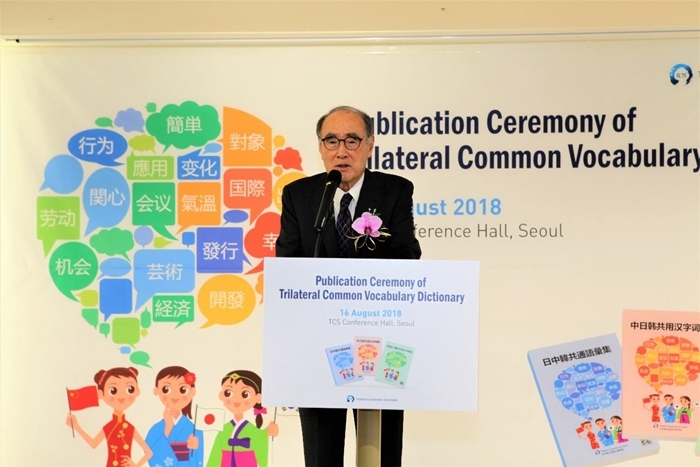 The compilation of Trilateral Common Vocabulary Dictionary (TCVD), as one of promotion activities for 808 commonly used Chinese Characters, is a project initiated by the TCS which facilitates the compilation work of trilateral common vocabulary dictionary under the joint cooperation of prominent experts and linguists from China, Japan and the ROK. It aims to deepen the mutual understanding and facilitate smooth communication among the three countries as well as to promote exchanges and research among the experts on Chinese characters and linguistics. Through the unremitting efforts for around two years since its launch in 2016, the TCVD has been completed and successfully published on August 16, 2018.